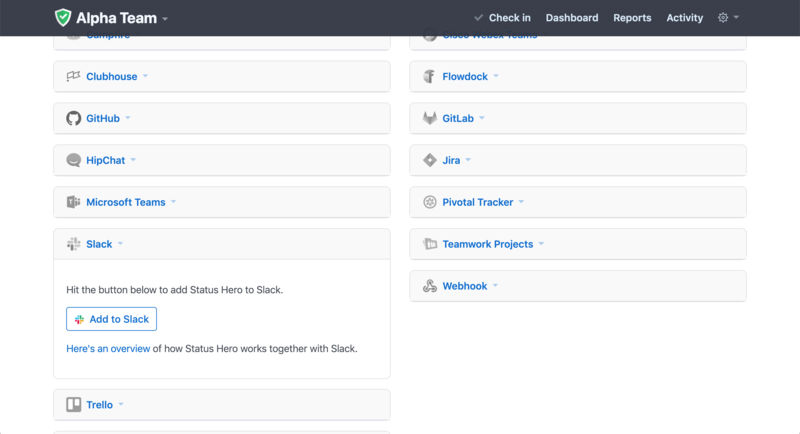 To hook up your Slack account to your Status Hero team, visit the Team Settings - Integrations page, open the “Slack” panel, and click on the “Add to Slack button”. 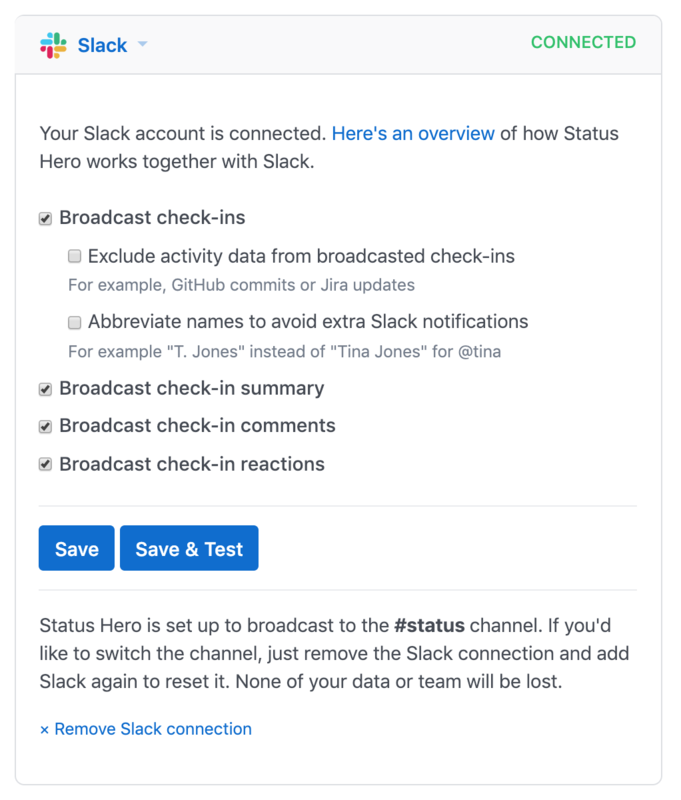 Status Hero will only connect with the people in your Slack account who are also Status Hero team members - it does this by matching email addresses. You can add other people from your Slack account to Status Hero by clicking on the “Add members from Slack” button on the Team Settings - Members page. A convenient /checkin command is available in Slack to everyone on the team. They can use it to check in at any time or to see a summary of updates and metrics from the whole team. To customize when you receive update broadcasts from Status Hero in Slack, open the "Slack" panel on the Team Settings - Integrations page. Once open, enable or disable the broadcast options. You can also configure whether or not to include detailed activity data from integrations in the broadcasted check-ins. When "Exclude activity data from broadcasted check-ins" is enabled, summary counts for activity will be shared instead of detailed item activity. We recommend this setting for teams with lots of members or ones that generate a large amount of activity. If your Slack connection isn't working properly, try removing and adding the connection back again. None of your existing data will be affected. To do that, visit the integrations page and click open the Slack panel. At the bottom of the panel, click or tap on the "Remove Slack connection" link. When the page reloads, click open the panel again and click or tap on the "Add to Slack" button. Note: The Slack integration is available in Pro and Corporate plans only. If you are subscribed to the Basic plan, you will need to upgrade to use the Slack integration.